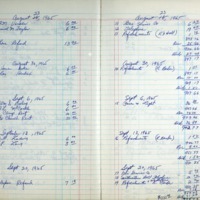 Sloan Lodge #729, “S13_F9_Ledger_1965 Accounts 23 August-20 September,” Genealogy Gallery, accessed April 20, 2019, http://content.mymcpl.org/items/show/7036. Brought to you by the Midwest Genealogy Center, part of the Mid-Continent Public Library system. © 2012-2017 Mid-Continent Public Library. All rights reserved.